Well, this sure is a blog post long overdue. You see, in my line of work, which is a combination of CMO/Co Founder of a startup (ZCast), tech blogger (on this blog and many others like TechCrunch, Business Insider, The Next Web, Huffington Post, Venturebeat, The Street, Mashable, and GigaOM to name a few), startup advisor (working in an advisory role with some of Israel’s leading startups), and mentor at pretty much all of Israel’s accelerators, I see a LOT of startups. 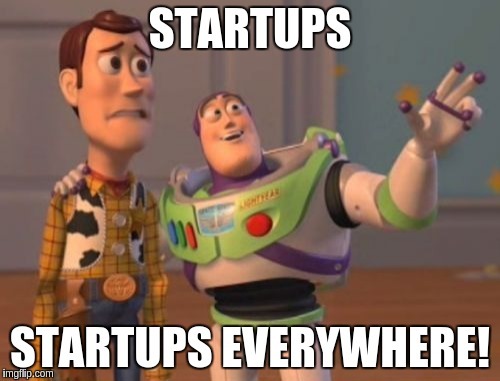 Like an obscene amount of startups. Of course, every conversation is different and the needs of every startup I meet are different. However, I have most definitely picked up on some patterns that seem to repeat themselves across the board. Certain phrases, certain buzzwords, over and over. When I am asked what I am seeing in the tech ecosystem in Israel and in the U.S, I often talk about some of the mistakes I see entrepreneurs making. To be clear, I meet these startups from a marketing angle, and I don’t specialize in sales, sales funnels, or pretty much any other kind of short time play. If that is what you are looking for, short term sales, and not long term branding, then perhaps this post is not for you. If, however, you want to build a global brand that supports your growth and expansion across several markets, I am pretty sure you are going to recognize some of the mistakes below. 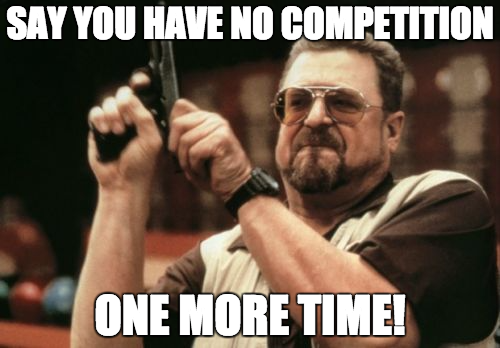 “I have no competition.” Shoot me now, Why do startups say this? Do they think it makes them look good? Yes, yes, they do. But do they really believe that they have no competitors? Again, affirmative. How can that be? I will tell you how. Their definition of a direct competitor is totally 100% wrong. How do they define it? To many startups, a direct competitor is a company that is offering the exact same product as them. If the product is even 10% different, then they are not a direct competitor. What a colossal and dangerous error! The way startups SHOULD define competition is based on the target audience. 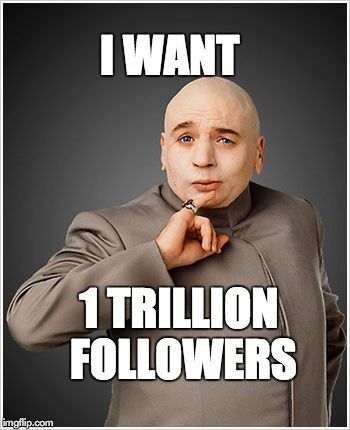 Who else is going after the same audience offering the same outcome as me? That person/company is my competition. If you are building a social network (don’t) of any kind, I don’t care that you think you are different from Facebook. The bottom line is, people spend x number of hours during the day on social. When offering another network, you are trying to take away from the time I would have otherwise spent on Facebook, Twitter, Snapchat, or Instagram. Period. You are directly competing with all of these platforms. 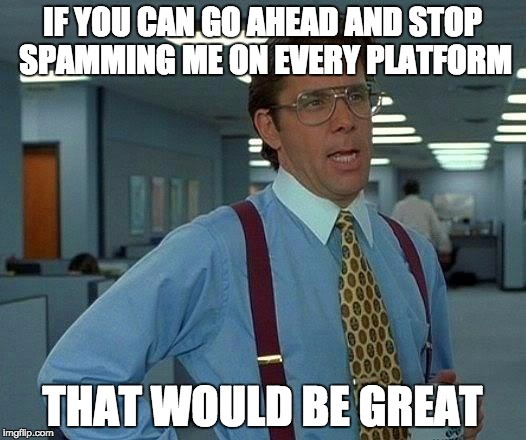 If you have a product that will help a publisher keep the readers on the page longer and another company is going after the same publisher with the same pitch, then you are competing for that publisher because, let me break it to you gently, publishers are not going to add two tools to their site that both offer the same thing. They just won’t. So next time, before you declare that you have no competition for your photo sharing app, think who else offers me the ability to share my pictures. Those companies are your direct competitor, even if in your mind, your filter is better than their filter. If you are writing about yourself, you can call it sales, you can call it push marketing, you can call it shameless self promotion, but you cannot call it content marketing. If you offer valuable content in any form, whether text, audio, video, or even social updates on a fairly consistent basis, then we can begin to talk about content marketing. Which leads me to my next point. Content marketing is NOT public relations. 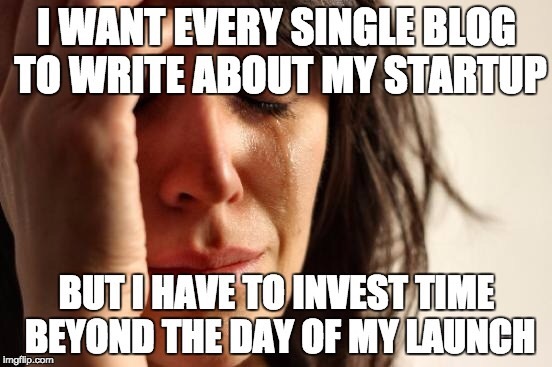 Getting a blog to write about you, your product, your launch, your funding, or anything else that is promotional and not informational is not content marketing. That is called public relations. As mentioned above, too many people mix up content marketing and public relations. If you are writing a piece for TechCrunch about your industry and it’s objective and valuable data about what you’re seeing, that is good content marketing. When TechCrunch writes about you because you, or your PR agency sent them a press release about your recent funding, that is called public relations. Also, sending a cold email to an enterprise journalist the day of your launch letting them know that you are building a social network for dogs is not public relations either. That is called being a moron. Good public relations is not getting a story on TechCrunch. Good public relations is having TechCrunch contact you and ask you if you have any news. Good public relations is TechCrunch writing a piece about your industry and instinctively including you as an example because of how interesting you are and because of the ongoing relationship you have cultivated with the relevant journalist there. Good public relations is looking at your assets and wrapping it in a way that is interesting to the audience you are reaching. The rest is just old school sales wrapped in some fancy buzz words. Notice the second word in that phrase, “Development”. In order to get business done, to achieve your goals, you first need to **develop** the right relationships. Folks, business development is not sales. Business development is not marketing. Business development takes time and if done right, can yield better and more long term results than sales and marketing combined. Hiring someone for business development is not hiring a Rolodex. If that person has existing relationships in place, fantastic, but if not, make sure they have the people skills to develop them. You cannot learn business development because at the foundation of it all is good people skills and the ability to pinpoint, target, and create the relationships you need to take your business forward. In that way, it is similar to marketing. 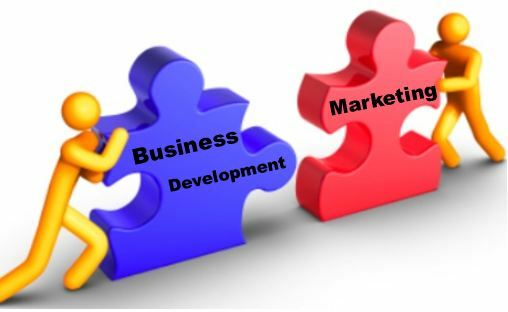 You can acquire the knowledge of the tools out there, the different platforms, and even learn some tactics, but with business development and marketing, you either got it or you don’t. Somehow when a startup decides to use Guerrilla Marketing, it gives them a license to spam uncontrollably. Or so they think. Not only is that not what Guerrilla Marketing means, but adding someone to your company Facebook group without their permission in the hopes that they react to the onslaught of notifications to which they are now exposed is just bad strategy. Plain and simple. It is not Guerrilla Marketing, it is not any type of marketing. It is spam. It is inconsiderate and it is stupid. Don’t do it. What Guerrilla Marketing really means is that you get your hands dirty partaking in relevant discussions pertaining to your niche, whether in forums, social, or blog comments. Key word is relevant. If you are selling Barbie dolls and there is a post about Barbie dolls with an ongoing discussion, then yes, get in there and share your insights, not your self promotional garbage. And if you are so inclined to use these comments to self promote, then at least do it honestly, and explain that you are representing the company and would like to let people know about what you are doing. Not only is that the right thing to do, but chances are people will respond positively to your honesty and perhaps actually come check out your site. In conclusion, startups, due to the nature and the speed at which markets move, like to take a short term view on their marketing and growth. I get it. But the next time you try to cut corners and find shortcuts, remember what you are trying to achieve here. You don’t want to be another one of those companies that spiked in traffic and buzz, then crashed and burned. You want to build a long term sustainable and global brand while growing your user base organically and responsibly. Now make sure your marketing plan reflects those goals.